DNC Chairman Timothy Kaine's decision to support "Choose Life" license plates could echo among women's activists who are among the most powerful financial supporters of the Democratic party. 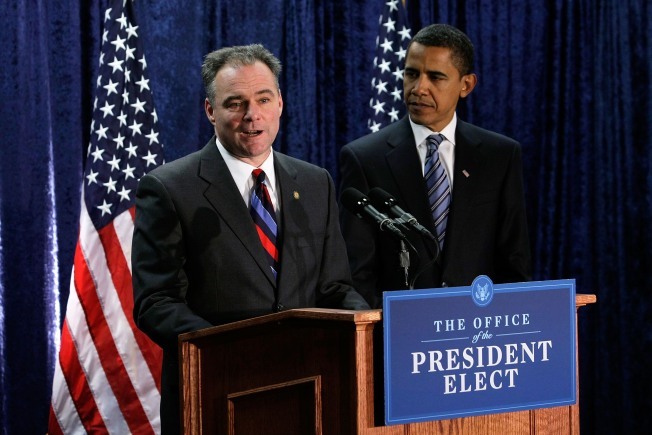 Tim Kaine, the Virginia governor and President Barack Obama's hand-picked choice as the head of the Democratic National Committee, infuriated abortion-rights groups Monday by signing legislation that gives abortion foes an important symbolic win. Kaine brushed off intense lobbying by abortion rights supporters in Richmond to sign a bill that allows Virginia motorists to advertise their anti-abortion views by sporting "Choose Life" specialty license plates. If Kaine were merely the governor of the Old Dominion, the move might have been less notable. Kaine—a Catholic who says he is personally opposed to abortion but pledged to leave the right to choose intact—won office in Virginia partly by seeking to reassure social conservatives. But he is now on a national stage. And his decision could echo among women's activists who are among the most powerful financial supporters of the party. “It is surprising that Governor Kaine would do this, but it’s all the more surprising that he would do it as chair of the DNC,” said Paulette McElwain, the president of the Virginia League for Planned Parenthood. McElwain exchanged numerous calls with the governor’s office over the license plates and organized a grass roots effort that logged more than 2,000 calls to the governor’s staff. In Washington, NARAL Pro-Choice channeled more than 17,000 emails and 200 calls to the DNC urging Kaine to veto the bill. “It is unfortunate that, even after receiving thousands of messages from Virginians and pro-choice activists across the country, Gov. Kaine has opted to sign a bill that advances a divisive political ideology at the expense of women’s health,” NARAL president Nancy Keenan said in a statement. The “Choose Life” plate was among a number of designs approved by Kaine, including one honoring the Washington Capitals professional hockey team. To request a plate, a group must get at least 350 people to prepay a $25 fee. Kaine defended the move by pointing out that Virginia has a “long-standing program” allowing customized license plates and said that if Planned Parenthood applied for a plate he would grant it. “I sign this legislation today in keeping with the Commonwealth's longtime practice of approving specialty plates with all manner of political and social messages,” Kaine said in a statement. Virginia joined 23 other states that offer similar license plates, which will raise funds for crisis pregnancy centers.